An aside is a dramatic device in which a character speaks to the audience. By convention the audience is to realize that the character’s speech is unheard by the other characters on stage. It may be addressed to the audience expressly (in character or out) or represent an unspoken thought. An aside is usually a brief comment, rather than a speech, such as a monologue or soliloquy. Unlike a public announcement, it occurs within the context of the play. An aside is, by convention, a true statement of a character’s thought; a character may be mistaken in an aside, but may not be dishonest. At many tables West played in 4spades and North always led a top diamond. Aside: I was taught in my cradle that in this type of situation you need get a count signal from partner. The simple (and obvious) way to do this is to lead the ace for attitude and the king for count. 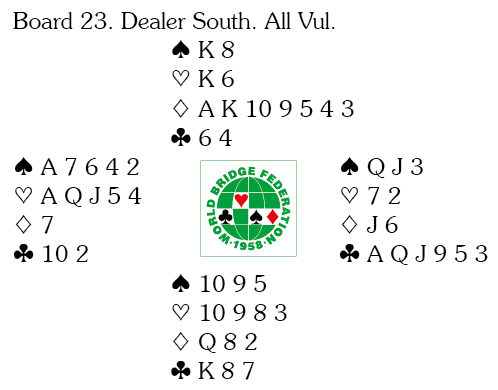 If North continues with another top diamond declarer has more than one way to make 4spades, but the almost universal approach was for declarer to continue with a low spade at trick three. Looking at the records you see that 4spades was made 5 times in the BB & VC, but only 3 times in the DT. One way to get home is to play a low spade at trick two. One way to go down is to run the ten of clubs instead. A tough defence is for North to switch to a club at trick two. If declarer finesses, South wins and can switch to a heart. The way to avoid this is for declarer to go up with dummy’s ace of clubs and then play a spade to the ace and a spade. Aside: One player switched to the six of hearts at trick two! The trick came back later when declarer took a heart finesse to go one down. The hearts6 is certainly a better card than the heartsK that was found at another table. In theory there is only one way to be certain of defeating 4spades, but you would be doing well to find it – North must underlead his diamonds at trick one so that South can win and switch to a heart. The idea of doubling 3diamonds to show a top honour is not a new one, but it can be a useful weapon to have in your armoury (I played it with the Rabbi). 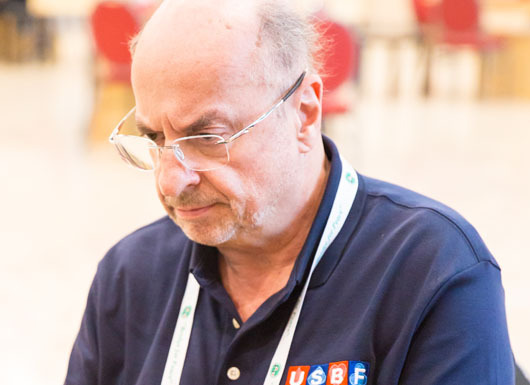 Here it works to perfection as North can now underlead in diamonds in complete safety – perhaps the nine is the best card, suggesting something in hearts? North led …..the ace of diamonds. (Luckily declarer found a way to go down. Exit North, pursued by South.